The other day, my school was on lockdown. Yep, that scary thing that happens when a dangerous criminal is on the loose and everyone locks doors, closes blinds, covers door windows with a black sheet of construction paper, and waits in the dark for the all-clear signal. I guess I’m supposed to be a reassuring presence to students in times like these, but I’m pretty short and harmless-looking. I also have the unfortunate habit of cracking jokes when I’m nervous. So in times of stress, I try to keep my mouth shut, my face calm, and my attention focused. Hey, better cookies than crack, that’s what I always say! And these cookies are pretty special. They’re gluten-free and nobody knows they are. They’re too busy stuffing their mouths as fast as they can. Bless their hearts. I’ve heard that in the South if you “bless her heart,” you’re actually insulting that person. I think that’s kind of funny, because when I say it, I’m expressing true appreciation. But I digress. These cookies were baked so that Kenny would have something to eat at my daughter’s third birthday party yesterday (cake coming up later this week). He loves gluten, that man. It makes it so much harder that he can’t have it. So I invented these cookies so he’d never know the difference. Okay, I know I’ve covered a bazillion topics in this post. Forgive me. My nerves were jangled up a bit the other day. I guess a lockdown will do that to most people. But I love my job every day. And that sentiment goes double for cookies! Cream the butter and sugar until light and fluffy. Add the egg and vanilla and mix again. Gradually add the oat mixture, beating each time until the dry ingredients are fully incorporated. Stir in the chocolate chips and Raisinettes. Chill the cookie dough for 30 minutes to an hour. When you’re ready to bake, preheat the oven to 350 degrees. Line two cookie sheets with parchment paper or use a silicone baking sheet. Scoop the dough into 1 and 1/2-inch balls and place them on the cookie sheet about 2 inches apart. Bake for 10-12 minutes until the edges are beginning to crisp and the middle is mostly set. Do not overbake. Do you know what a Triple Threat is? In theater (yes, I used to be a theater nerd), that term refers to someone who can sing, dance and act. They don’t just barely pull it off, either. They can do all three with amazing ease and style. We tend to hate people like that. I kid, I kid. 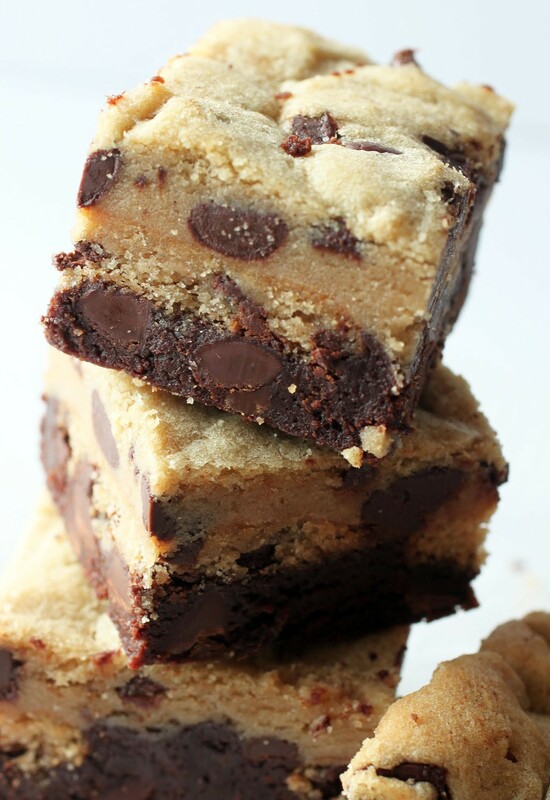 Consider this bar the triple threat of the cookie bar world. All other bars look at this bar and they’re jealous. You know why? Because we have three things going on here: brownie, cookie, and more cookie. Sandwiched between the layers of brownie and chocolate chip cookie is…Chips Ahoy! Cookies are out, people. Cookies with a gigantic pile o’ frosting and a chocolate shell? In. So in. I never knew about Hi-Hat cookies until I started reading food blogs. And Julianne is the master, so I learned from her! This is my first attempt, so bear with me. 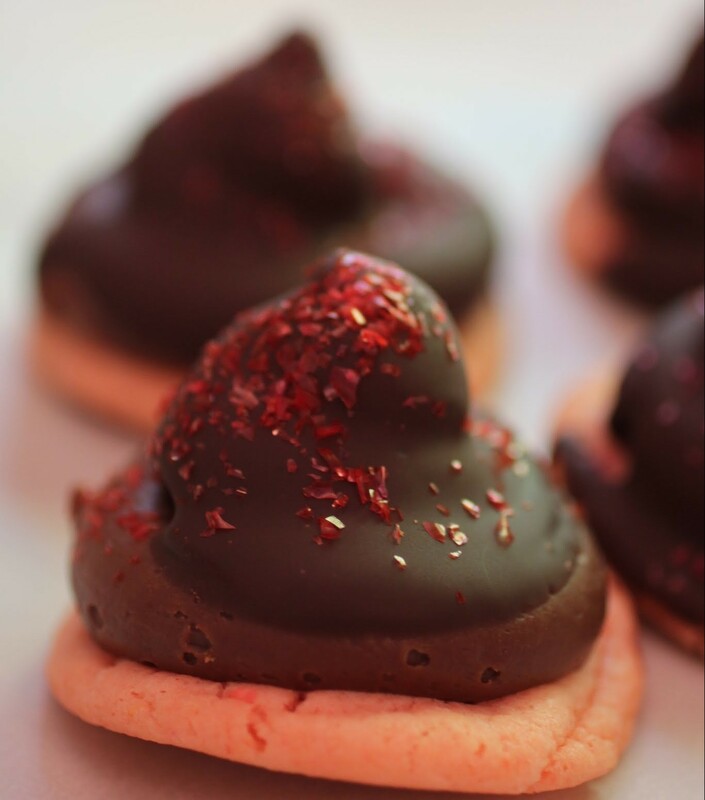 For a while now, I’ve been trying to come up with a chocolate-covered strawberry concept in a cookie. Originally, my plan was to do something simpler. But then, how could I resist a hi-hat? Gosh girl I hope you all were ok!! These cookies look dangerously delicious! I have always been a raisin hater in my food but looks like I just might have to try your version! Everything was fine at the end of the day, Ami! And I’m a raisin hater too, but when it’s couched in chocolate…yep! 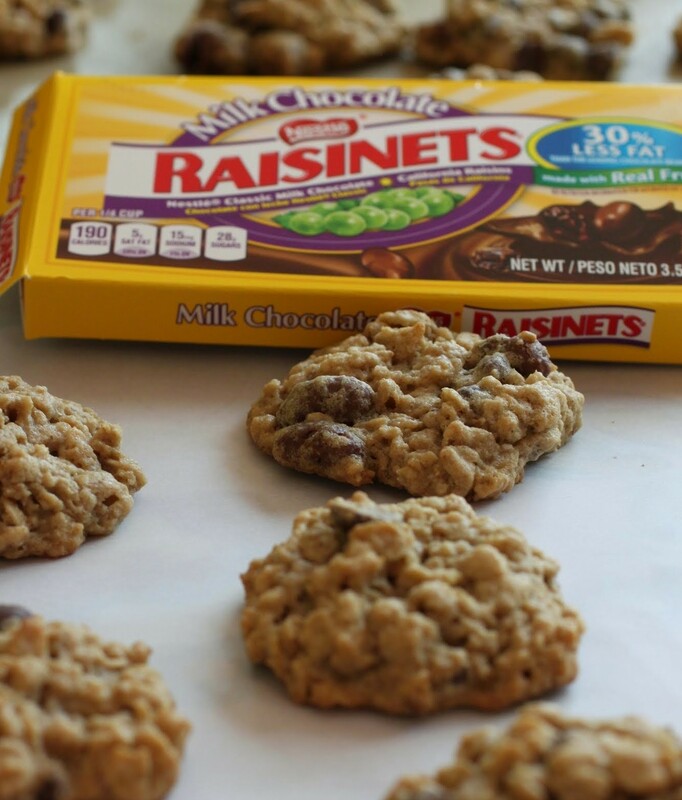 What a great idea to use rasinettes in these cookies, Mir! 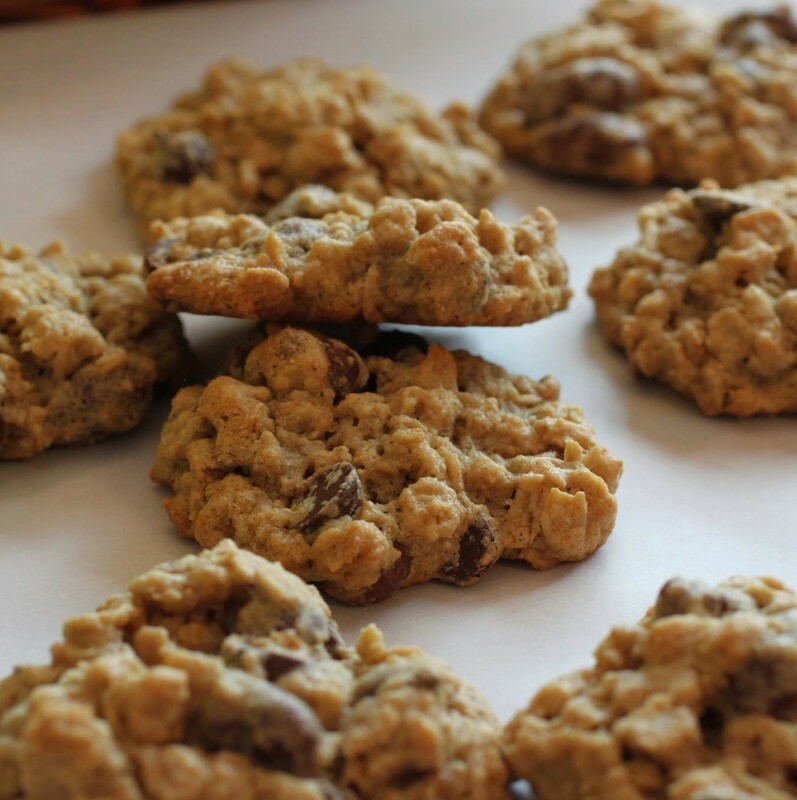 Sounds like the perfect oatmeal cookie! Thanks, Gayle! I should do this every time…but you know, baking bloggers have to switch it up constantly! Your school was on lockdown?! that is so scary. . I’m sure the kids were freaked out? but yes, cookies and screaming. . a good way to release the tension. . glad everyone was safe!! The kids were so good, Alice, and everyone was safe. But it was definitely intense for a few hours! Okay, this is just genius. 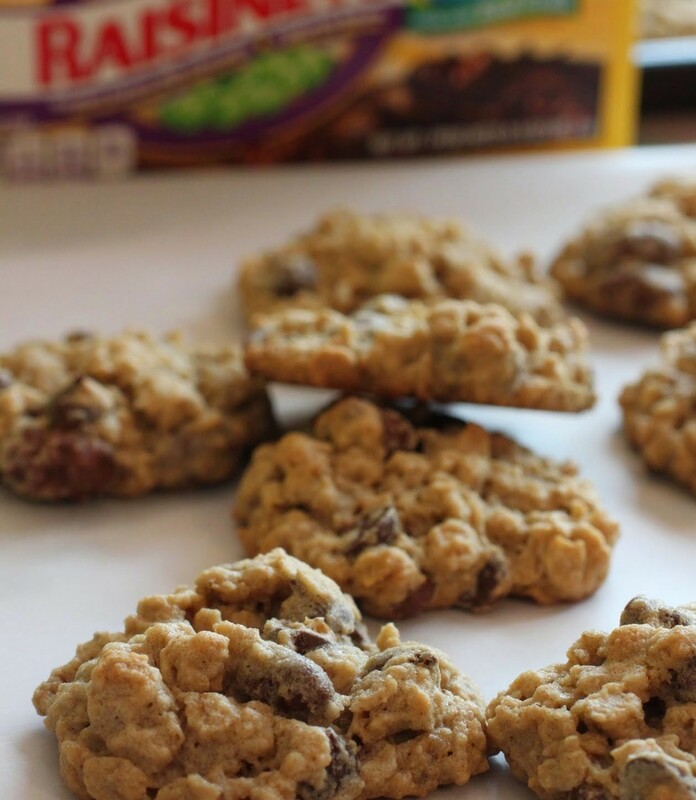 Some love chocolate chips in their oatmeal cookies and some like raisins so why not combine the two with a raisinette. Love it, Mir. Thanks, Jen! I like compromises IF everyone is happy. I hope this is one of those times! Thanks, Lily! That’s how I like to do breakfast, too! How scary that you had a lockdown! I’m glad everyone is ok. It sure is a good thing you had these cookies and a good scream! I love that you used raisinettes! Good screams are always the way to go, Rachelle. As long as I wait until the children aren’t there. 🙂 Thanks! That sounds scary! I’m glad everything was fine in the end! And you are right you can never go wrong with cookies! Love these Mir! My grandmother used to say, “Scare me, but don’t hurt me.” I kind of like that philosophy, Manali! Haha cookies better than crack. And lockdowns scare me. I’ve only ever been through drills but I get all scared and can’t be because, well, adult in the room. All I have to say is these cookies are just genius. 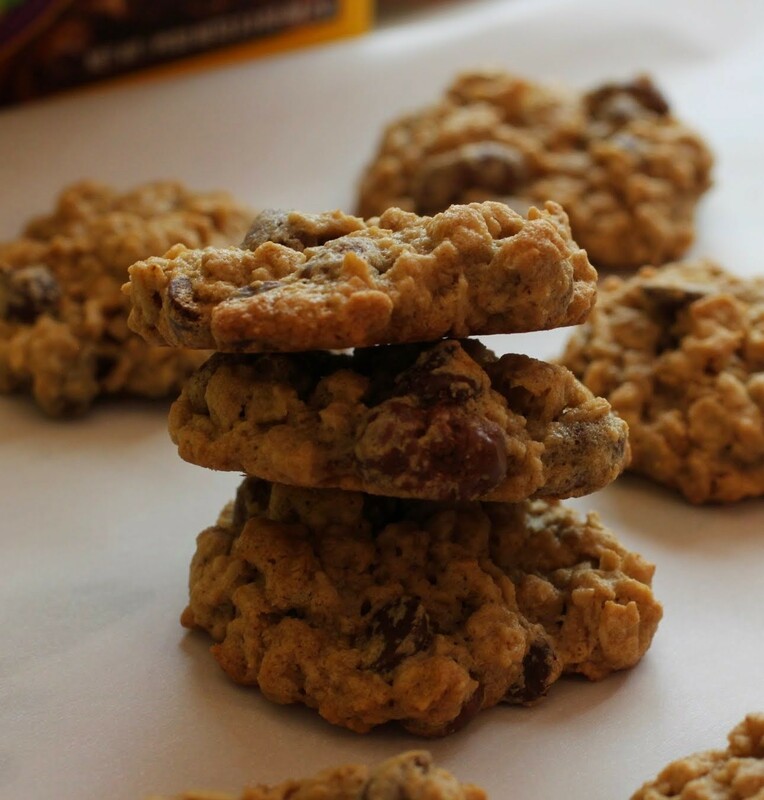 No more debating chocolate or raisins in cookies, just eat them both! Love these, Mir. Thanks, Danielle! I like to remove all points of contention from cookie eating! Yikes, having a lockdown sounds pretty awful, so glad everyone was okay. That would definitely be nerve wracking though! 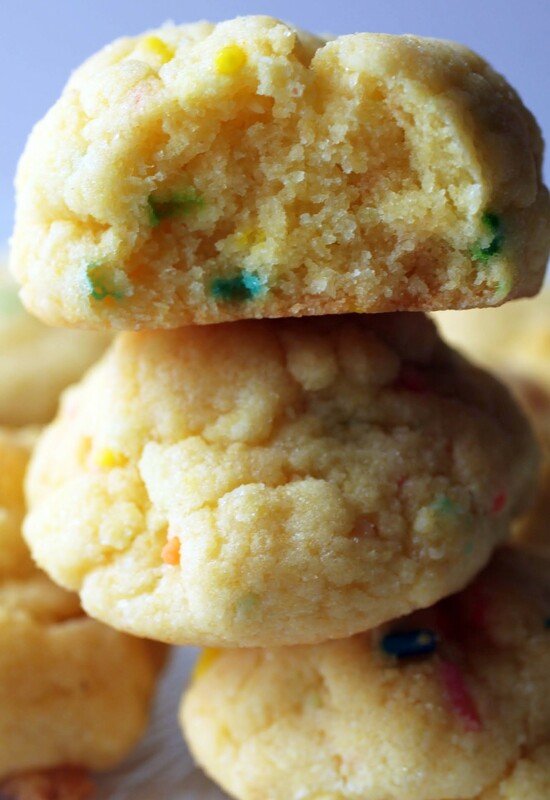 These cookies look amazing Mir! And raisinette doesn’t have an “e” on the end? Really? That seems wrong, I agree with you, it should! I know, right? Where is that E? It’s not okay! Thanks, Stacey! Hubby and I took a little road trip recently and he picked up a bag of raisinettes for our travels..I hadn’t had them in the longest time – now here they are again! The raisinette gods are telling me something…These are awesome! It’s a sign, Annie! Bake something with them! It’s definitely a shame, and I go to work every day knowing that part of my job is to keep these kids safe. Your daughter feels the same way, I’m sure! No tree nuts for sure. I try to keep them out for my allergic colleagues! I love oatmeal, too! Oh my goodness – good thing you are ok! That would totally, completely freak me out. I would have had to eat that entire batch of cookies to recover. Cookies fix (almost) anything! Being a Southerner myself.. I had to “lol” about what you said on the “bless her heart” thing. It’s funny (and true)! You can say it in a “aww, I feel bad/poor thing” kind of way, or in a more insulting tone like you said. It all depends on the context, but I chuckled a little because it’s such a common phrase down here! 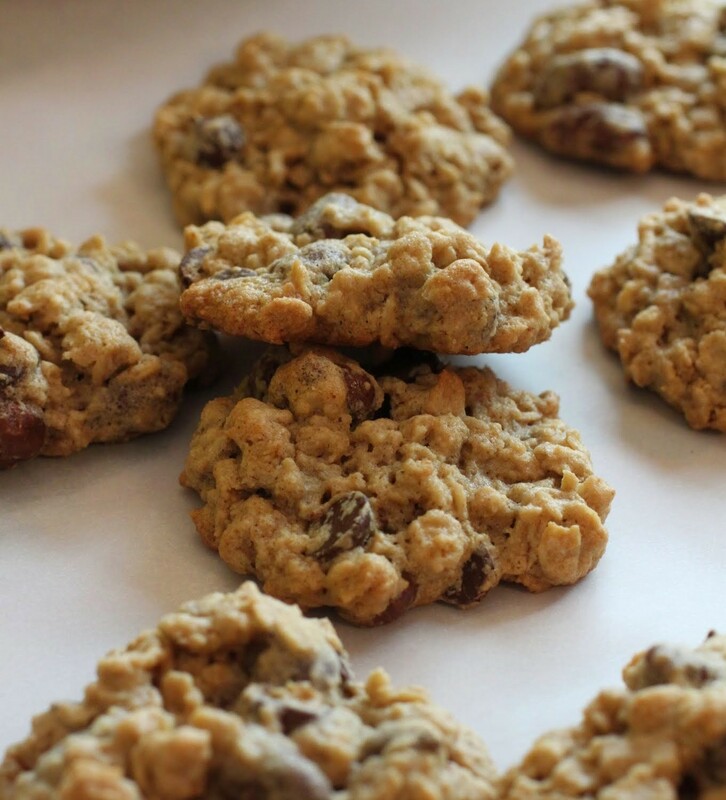 Anyways – I think you’re a genius… putting the raisinette INTO the cookies?! Winning! Such a great idea, my mom will LOVE these cookies. Great recipe! I’m so glad you do the “bless her heart” thing. I think it’s so funny! Hope your mom loves the cookies, Heather! Lockdown? It sounds scary, hope everyone is doing well Mir! And as I’ve said before- your recipes are so creative! Rasinette cookies? Such a great idea! They look amazing! Thanks, Mira. I love doing different things every time! Variety is the spice of my life, for sure.